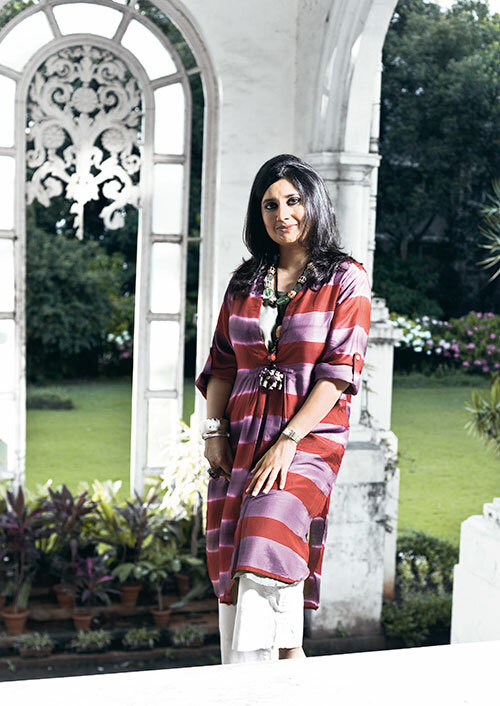 So why am i meeting entrepreneur and business person Gayatri Ruia at home, in the Ruia family’s 100-year-old Colonial bungalow on Mumbai’s leafy Mount Pleasant Road? 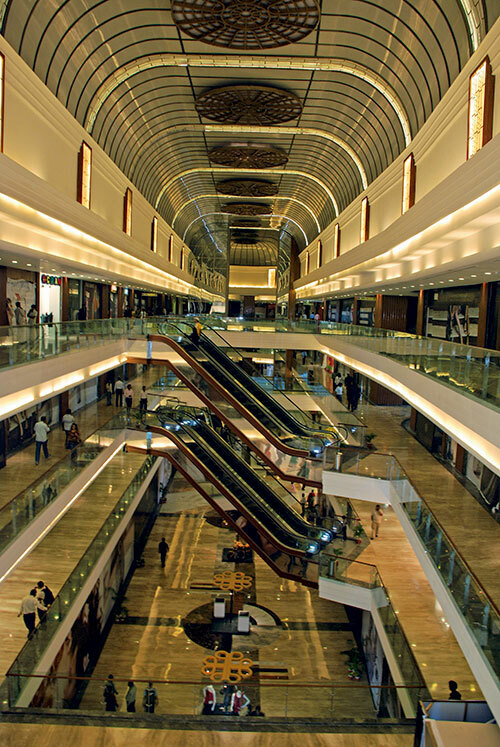 Why indeed, considering that she and husband, Atul, managing director of real estate company, Phoenix Mills Limited, have set up the city’s most recent high-luxe shopping destination, Palladium, an area covering 200,000 square feet of strategically located retail space. I cannot say that I know, except that I wonder if there is a clue here, in this mansion of peeling proportions, a landmark of sorts in the city’s building hierarchy, to unravel the design philosophy behind the fashionista’s newest playground. And, sitting back, in this room refurbished last in the ’50s in the decoratively geometric art deco style of that decade, imbibing the cool of a boldly delineated marble flooring on a blistering hot day, I begin to see that modern construction and architectural design notwithstanding, the Palladium is indeed rooted in the sensibility that is Mumbai, or was Bombay. 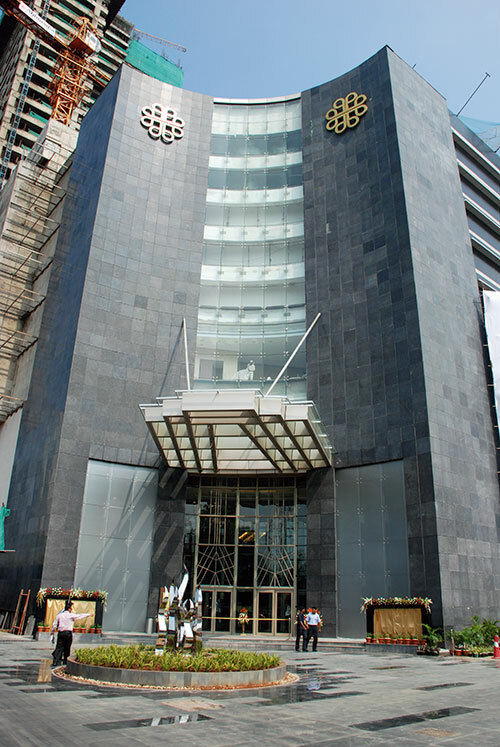 Tapping relevantly into Mumbai’s urban vibe then is Palladium, with its super exclusive and luxury brands, stretching like a luxurious kitten, from the ground to the third floor of the still-to-be-opened leisure hotel Shangri La. It features a three level, glass-domed atrium where hand-laid Italian marble and onyx are abundantly in evidence. Strategically placed antique art deco furniture and objects d’art are meant to create a refined sensibility, aimed at showcasing brands and labels in an atmosphere conducive to prowling without being intimidating. Built on the family’s 100-year-old mill plot, after the policies changed allowing new construction from scratch, the structure rises amidst the Phoenix Mills area, rubbing shoulders with ancient mill-themed frontages that stand today as testimony of the city’s textile history. If indeed Mumbai was lacking an entertainment area to call its own, here it is, and about time too. Ruia had already earlier been responsible for setting up Sky Zone, the high street floor at High Street Phoenix. Business development director of this venture, Ruia, sometime designer (she supplied to Melange and Ensemble), artist (experimented with Muranese art glass with artist Manjit Bawa), boutique owner (Mogra) and full-time mother (‘costume Mum’ at her daughters’ school), is busy negotiating a gym class with daughter Sharanya. Daughter Tarini is nowhere in evidence. Surrounded by the colourful trappings of an art collector, which Ruia is ‘in a small way’ – a Souza still life on an easel, Ara’s luscious nudes, a driftwood sculpture, some ancient bronzes – she is gentle and firm, putting forward the classic argument, ‘should I be a good mother or a bad one’. Good mother dictates that gym is a must, even as the child turns cartwheels to interpose her negotiations. “This is not negotiable,” her mother, straight-backed in her Savio Jon tunic, says firmly, turning away. “I wear a very interesting title,” she’s back to me now, the other matter firmly disposed of, “and I get to meddle with and decide most things…the tenant mix, the business plans, the design plans….” She started out by asking the question, “What is the well-heeled Mumbaiite looking for? People want a lifestyle experience they can relate to and so we give them a 40,000 square foot bookstore, Landmark Books; two or three F and B options because one choice of coffee is not enough; as well as the first opportunity to experience a large-format Zara, a stand alone Calvin Klein and the unusual The Comedy Store.” Almost every known Indian designer approached her for a space, she claims but, “No, there are no personal choices here. We conducted a dipstick survey in the market and decided on the labels. Rohit Bal for example, may be the poster-boy for Indian fashion but also turns out quality work consistently.” Ranna Gill, Suneet Varma and Anita Dongre too have made the mark. And, unusual in this bursting city of ours, “With Palladium, we have tried not to be just a property developer but a thinking developer. We have built in a lot of infrastructure to pull this off, we have parking for up to 3000 cars which we think is important for the future.” Besides dedicated parking, forex counters and banking services, personal shopping assistance, VIP lounges, luxury salons and baby care facilities will dot the complex, offering international facilities and conveniences to the increasingly more demanding Indian shopper – mall prowlers that Gayatri Ruia has worked hard to understand.